The stone-block men and the stone-block lad are clothed for Siberia and a couple of them hold umbrellas over themselves, and clutch some baggage each. 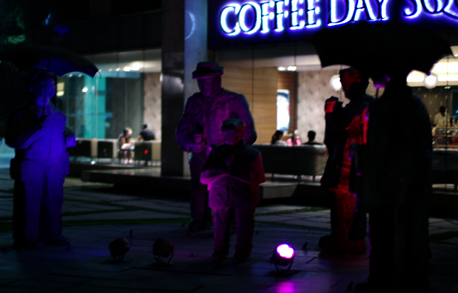 They, and their umbrella, and their baggage, and their demeanor, are all gray and mysterious, and utterly alien. During the workday a fountain rises low and falls upon them, but when I pass them before eight they are cooled only by the morning breeze in the relative open where Cubbon Park ends and UB City begins. The other day a tramp sat in an asana there with the light flitting on his face, before Cafe Coffee Day, and the breeze blew his long beard here and there and he was abuzz with the energy of the morning that flowed about him and into him, and he guffawed at every rider who went round the bend before him. He spoke out loud, yet none could hear, and he tried to connect with the traffic, rising on his haunches, and almost none saw him, and none laughed back in greeting, and none took heed to see the hilarity in the morning, in life under that smothered sun, in our rush through the curdling smog, in our concentrated frowns, in the beginnings of the frenetic Bangalorean week. Hical stall at Electronica, BangaloreDuring the week we participated in Electronica, advertised as the largest electronics fair in India, even if it was in only two smallish halls when compared with the seven or nine gigantic halls in the parent fair which goes by the same name in Munich. But the action in those two halls revealed the growing electronics business in India. We did well, but when the fair drew to a close I worried if others did better. And when I left our stall to see how others were doing, when I came to the stalls of the machine manufacturers, I gawked at the new models, and sensed a recently receded emotion reappear. Machines depress me, and the more they can mint the more they appall me, like when I see in the west the highways which arrive into giant clovers and go hurling over one another and twist and fall and speed away to everywhere. Linkin Park, Minutes to MidnightThe week was saved because of The Clash: I listened to London Calling, and delighted in the exuberant vocals whose boyishness is accentuated by their blocked-nose voices. London Calling! The Right Profile! I loved the album so much. I’m going to Germany this month-end and to London thereafter, and today I bought a ticket for a show for Lennon in Liverpool, on 8-October, the eve of his 70th birth anniversary. I told Yashas I will also attend in Germany a Linkin Park concert, and he laughed for so long. “They’re not for you, daddy” he cried, “my friends will never believe my father likes Linkin Park!” I put off the purchase of that ticket and bought another, for Leonard Cohen’s concert in Stuttgart. 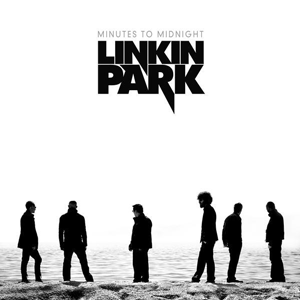 But I’m listening to Minutes to Midnight as I write this, on this weekend evening, and I cannot understand why Yashas thinks Linkin Park aren’t the rock band for me. They’re as foreign to me as any other rock group, but I’m swaying and rocking and nodding while I delete one word, and throw back my head to think up another.